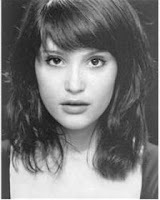 I first saw her in St Trinians (I know it's quite trashy, but it is funny) and thought she was just so pretty. 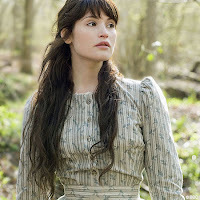 Then she played Tess in a TV adaptation of Thomas Hardy's 'Tess of D'urbervilles' and really proved just how good an actress she really is. She was brilliant in the TV series and her portrayal as Tess was amazing. At only 23, she's really proved herself to the world and even had a role in 'Quantom of Solace'. I saw her in person once and she looked great. I know a lot of celebrities don't look that good without a lot of make up, but she looked just as pretty. What I love about her is the dresses she wears to premieres. They're all so colourful. Definitely one of my all time favourite actresses. I love all the Star Wars and thought she was briliant in them. Such a versatile actress. She is also very clever and has a degree in Psychology from Harvard University. What I love is how much efforts she puts into her roles. She really shaved off all her hair for her role in 'V For Vendetta' and you should really watch her in 'Goya's Ghost'. On top of this, she also does a lot for various charities and organisations. She has her own brand of Vegan footwear and is really concerned about environmental issues. She is also a spokesperson for an organisation that helps finance women owned businesses in developping countries. You might not have heard of her unless you're a sci-fi freak, like me. (I'm a total nerd). She is in the Terminator TV series and was also in a movie called 'Serenity'. I absolutely loved her in the Terminator series. She looked great in it: She had a very edgy style and spent a lot of time in combat boots and pretty tops. She's got a cute girl next door look to her and always looks stunning, not matter how casually she's dressed. Shes a huge animal lover and supports various animal charities. We all saw her in 'Mean Girls' and we hated Regina so much that we had to love her. Then we saw her in 'The Notebook'. I love that movie so much, and I still get emotional everytime I watch it. You don't get more opposite than those two movies. I think she has the most beautiful smile and her acting is so much fun to watch. I saw her in 'The Family Stone', and it shows the huge range of her acting. I love Lauren Conrad. I've seen every episode of The Hills and think shes great! I love seeing what she's wearing every episode, and how she does her hair. She's one of my biggest style icons at the moment. She's a beautiful young woman, who also has a comedic side. I saw her on an episode of Family Guy and she was so funny in it. I can't wait for her to get going on her line again, and can't wait until her book is available here (I can't believe I have to wait until October!!). But she's multi-talented and is actually the reason that I love fashion so much. I was a bit of a frump until I started watching the Hills and loved her style so much and I got interested in fashion. Who are your girl crushes? Or guy crushes for any of you male readers out there. Love this post! You picked out some great shots! I think my fave is Rachel McAdams in her grey trench coat with the red belt. Fab! Lauren Conrad is definitely my favorite. She always looks great. She is one of my fashion inspirations as well. I wish I could have her wardrobe! Haha! I can't believe you have to wait until October for her book! That's so long! But I think you'll really like it since you're a Hills fan! I loved Gemma Arteton as Tess! It's weird seeing her in modern clothes! I agree Natalie Portman takes her acting seriously. She is so accomplished and I love that she keeps a low profile and isn't fame obsessed like many other actresses her age. Rachel McAdams has such a wide range of roles and she hits them all perfectly. I love the Family Stone. I don't think it got the attention it deserved. My girl crushes are Ali Michael, Scarlet Johannson and Kat Dennings. Oh I love Lauren and Gemma! I was so annoyed when the press started calling Gemma fat...she couldn't be further from it! And LC has the best hair ever! I also love Jamie King, Megan Fox, Daisy lowe and Chloe Sevigny too - they're all so damn cool in their own way! Fabulous girl crushes! I especially love Natalie Portman! Ooh. I ADORE Natalie Portman too. I also love Diane Kruger. That girl has got such great style. I love Lauren Conrad's dressing sense, but she's wayy too ditzy in the Hills. mehh. Great post! Lauren Conrad is one of my favorites too. Rachel, Natalie, & Gemma- yay! Tess of D'Urbervilles is one of my favorite novels and she looks just like I'd imagine Tess (Though Justine Waddell played her very well!). Rachel--classic. Loved her the Notebook. Natalie, she's been around so long, it's hard to forget she managed to age gracefully through the younger years! LC, Alexa Chung, Chloe Sevigny..I love their style! I also like Cameron diaz laid back style! great choices. OMG how can i choose?? nicole richie, rachel bilson, maggie gyllenhaal, elisha cuthbert, and shannyn saussamon are the first 5 that come to mind, but i have about a MILLION. youre so right about gemma arteton, she's beautiful. I don't watch the hills but lauren conrad is really pretty and has an awesome sense of style. Great post! and thanks for your sweet comment lovely! I love Natalie's wonderful sense of style. And Rachel is so beautiful! Oh what a great post! I love Natalie Portman too! I also love Penelope Cruz, Halle Berry, Freida Pinto!! Summer is FANTASTIC! Have you seen her in Firefly (the TV series that went before Serenity), one of my favourite series ever. I thought this was a creative post! You had some great choices! Of course I'm a big fan of Lauren Conrad, but the other girls you chose were great nt from and different from one another! i am SO IN LOVE with Rachel McAdams !